1. An environmental teaching conference is coming to Bay City. The Michigan Alliance for Environmental and Outdoor Education is holding its 23rd Annual Conference from Oct. 7-9 at the Delta College Planetarium in downtown Bay City. The event will bring together teachers, naturalists, and outdoor recreation leaders from throughout the Midwest. This year’s conference will explore the concept of sustainability and ways to address the concept in teaching practices. Topics to be discussed include earth science and technology, Michigan agriculture and freshwater studies. Field trips also are planned aboard the Appledore schooners, operated by BaySail, and to the Saginaw Bay Visitor Center at the Bay City State Recreation Area. 2. Invasive reeds are being doused along Saginaw Bay. The reeds are a plant called phragmites, which have sprouted up along large parts of the bay shoreline in recent years. Bay County officials say aerial spraying to control the plants will be done along the the shoreline at the county-owned Pinconning Park and Fraser Township’s Linwood Scenic Park. The aerial treatment will be done by helicopter, weather permitting, sometime during the next several weeks. A herbicide mixture will be used to treat areas with dense stands of phragmites, which can grow to be more than 10 feet high. There will be a 24-hour water use restriction in the treatment areas with signs posted against swimming and wading at the sites. Phragmites is a perennial wetland grass. It thrives in coastal and inland environments, chokes out native habitat for birds and mammals, and makes it difficult for humans and wildlife to access the water bodies it surrounds. A chemical released through the plant’s root system also can kill fish. 3. Other invasive plants have already been removed by Huron Pines Invasive Species SWAT Team. The group says it’s removed every blossom of purple loosestrife on the North Branch of the Au Sable River. In August and September, the team covered more than 20 acres of riverbank, pulling and digging out single and small groups of plants. They also clipped blossoms from large areas to prevent seeds from entering the river. The team of volunteers received assistance from the North Branch River Keepers. 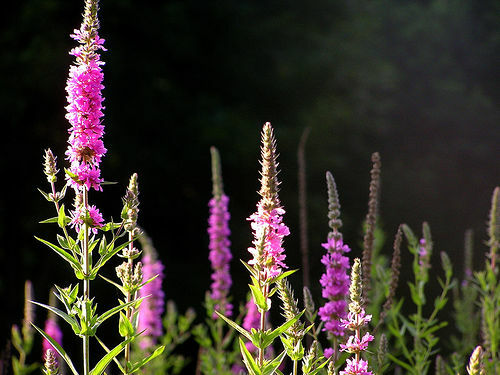 Purple loosestrife is a perennial herb native to Eurasia. It decreases native vegetation, can alter a wetland’s structure and function, and forms a dense monoculture where it grows.